Set on 3 beautiful acres just off Main Street in the center of Tiburon, The Lodge's public spaces are furnished in upscale lodge style with pine armchairs and leather sofas before stone hearths. Rooms have plantation shutters and windows that open, as well as a large desk to work (wireless Internet is complimentary). The lobby is stocked with board games, books, and DVDs. Curl up on the couch by the fireplace and read or gather the family for a game. Tiburon Tavern serves farm-to-table fare for breakfast, lunch and dinner and offers local wines, and beer from local distilleries like Marin Brewing (just down the road). Enjoy happy hour on the front patio while people watching on Tiburon Boulevard. In-room dining from the Tavern's menu is available. Tiburon is on the San Francisco Bay Trail: take a walk or cycle for miles on a path that winds along the waterfront (you can rent a bike at the front desk). 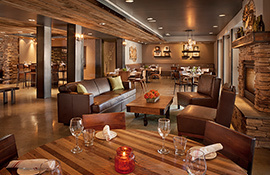 The Lodge at Tiburon is 1 block from the San Francisco Bay, and 1 block from Tiburon’s historic Main Street. San Francisco is a 20-minute ride by either ferry or car, and Napa and Sonoma are 40 minutes north by car. Reservations must be cancelled 72 hours prior to date of arrival. The quietly elegant atmosphere and practical yet relaxing layout of The Lodge at Tiburon makes this bayside oasis an outstanding venue for corporate events, boardroom meetings, family retreats, and wedding receptions.